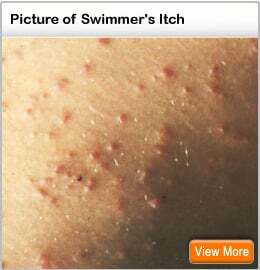 Swimmer's itch, also called cercarial dermatitis, is a skin rash caused by an allergic reaction to infection with certain parasites of birds and mammals. These microscopic parasites are released from infected snails who swim in fresh and salt water, such as lakes, ponds, and oceans used for swimming and wading. Infection is found throughout the world. Swimmer's itch generally occurs during summer months. What are the signs and symptoms of swimmer's itch? Within minutes to days after swimming in contaminated water, you may experience tingling, burning, or itching of the skin. Small reddish pimples appear within 12 hours. Pimples may develop into small blisters. Itching may last up to a week or more, but will gradually go away. The adult parasite lives in the blood of infected animals such as ducks, geese, gulls, swans, as well as certain aquatic mammals such as muskrats and beavers. The parasites produce eggs that are passed in the feces of the infected birds or mammals. If the eggs land in the water, the water becomes contaminated. Eggs hatch, releasing small, free-swimming larvae. These larvae swim in the water in search of a certain species of aquatic snail. If the larvae find one of these snails, they infect the snail and undergo further development. Infected snails release a different type of larvae (cercariae, hence the name cercarial dermatitis) into the water. This larval form then searches for a suitable host (bird, muskrat) so they can start the lifecycle over again. Although humans are not a suitable host, the larvae burrow into the skin of swimmers, which may cause an allergic reaction/rash. The larvae cannot develop inside a human and they soon die. Can swimmer's itch be spread from person-to-person? Who is at risk for swimmer's itch? Once an outbreak of swimmer's itch has occurred in water, will the water always be unsafe? No. Many factors must be present for swimmer's itch to become a problem in water. Since these factors change (sometimes within a swim season), swimmer's itch will not always be a problem. However, there is no way to know how long water may be unsafe. Larvae are generally infective for 24 hours once they are released from the snail. However, an infected snail will continue to produce cercariae throughout the remainder of its life. For future snails to become infected, migratory birds or mammals in the area must also be infected so the lifecycle can continue. What can be done to reduce the risk of swimmer's itch? Avoid swimming in areas where swimmer's itch is a known problem or where signs have been posted warning of unsafe water. Encourage health officials to post signs on shorelines where swimmer's itch is a current problem. Do not attract birds by feeding them in areas where people are swimming. Yes. As long as your swimming pool is well-maintained and chlorinated, there is no risk of swimmer's itch. Portions of the above information have been provided with the kind permission of the Center for Disease Control and Prevention. (www.cdc.gov).